Hotel is hard to find. Check in was very quick and efficient. The room was very hot and stuffy when we arrived. We managed to air it out but mold was already growing in the bathroom. There was dust everywhere. When we complained about the mold we were just told they would make a note of it. The elevator broke the first night we were there and it took 3 days to fix. It is a beautiful old building but is in dire need of renovation and cleaning. Great location by the river. 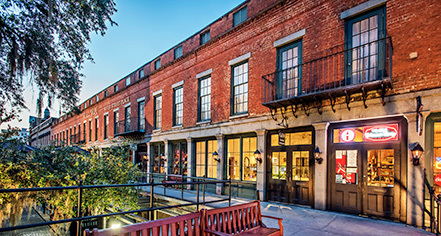 We love the location of the River Street Inn. It is right in the middle of everything. A river front room with balcony is a must. The river traffic and riverwalk traffic is wonderful and most enjoyable. Thanks for staying with us swimmer317. We are so pleased that you enjoyed our fantastic river front location and your balcony overlooking River Street. It is a one of a kind view! We hope to see you again the next time you're in our lovely city! Over all the property is run down and shop worn. 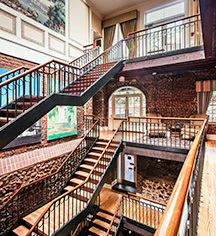 I love a great older repurposed building for a unique stay. The River Street has a great location, but that is about it. Our room was not in great shape. The bathroom was run down, rust hardware, lighting that did not work over the vanity and grout that was missing from the floor tile. The carpet in the room was stained and the river view, if you could call it that, was through a very dirty window. Overall the it just felt dirty. The walls are paper thin, so you can hear every conversation in the adjacent rooms. But, our worst experience was with the staff. We had nothing but, curt, uncaring front desk encounters. Totally unhelpful and an attitude that made us feel like we were imposing on them when we had a simple question or basic request like asking for change in order to be able to tip their own staff! I cannot recommend this property to anyone as it is now. There are better properties in Savannah for the money. Thanks for staying with us John W. We appreciate all of our guest feedback and are glad you enjoyed our fantastic waterfront location! We apologize for any inconveniences with our team. We hold out southern hospitality to heart and want every guest to feel at home. We will review your feedback with our team members to ensure our high level of customer service is being upheld with every guest. We will be undergoing an extensive renovation soon. We hope you will come back and see our updates once renovation is complete! My husband and I spent three nights at the River Street Inn. Just finding the lobby was kind of crazy. My husband had to double-park on the very busy waterfront street while I tried to access the inn with the help of a current guest who had his room key (needed to operate the elevator) and directed me to the lobby, which was on the 4th floor. Access from the other side is a bit easier, but parking can be problematic. Fortunately, a kind valet parking attendant moved his own car so we could have his spot for the first night (free) and move the car to a garage the next morning. Our room was spacious, if not exactly luxurious. Bed linens were a little tired-looking, but everything else was fine. One day, however, we returned from our day of walking to find that the room had barely been cleaned--bed was made, but dirty glasses were still there, coffee cups hadn't been picked up, bathroom looked untouched. We spoke to the desk clerk, who said she'd have to call the maid back in because she'd already left for the day. The room looked much better when we returned after dinner, but my iPhone headphones, which I had left carefully coiled up on the nightstand, were missing. We searched the room from top to bottom, but I know where I left them and they were gone. Pissed-off maid? I'll never know...I reported it at the front desk but of course never heard anything. At least it wasn't something irreplaceable, but it left me feeling not-so-comfortable about the place. Thanks for staying with us HondaTravellers. We are so sorry you came in on the back side of our building but are pleased our valet was able to assist you when you found the lobby area. We will be undergoing a renovation shortly and hope you can come see our updated look once renovation is complete! We will follow up on the missing iPhone headphones. Please contact the hotel again directly to ensure we have your proper contact information. and extremely dirty. Not dirty as in housekeeping forgot to clean - but months/years of dirt buildup and neglect. First picture below shows dirt on tissue paper from simply wiping the floor. Second is mold on shower curtain (probably exacerbated by fact that there was no fan). Coffee machine in bathroom was unsanitary. Dirt in corners and dirty walls. Dirt on phone (that didn't work properly) I don't mind old and even a bit worn, but this was just filthy. Yes, location great but how this place has favorable reviews is beyond me. Thank you for your feedback Lbrady. We appreciate all of our guest reviews as it helps us improve our services. We are going to be undergoing a major renovation soon and we look forward to a fresh new look and updated facilities. We hope you can come see our updates once renovations are complete!